A revised version of the original On The Rocks website which was developed in partnership with Pedleyonline some years ago. 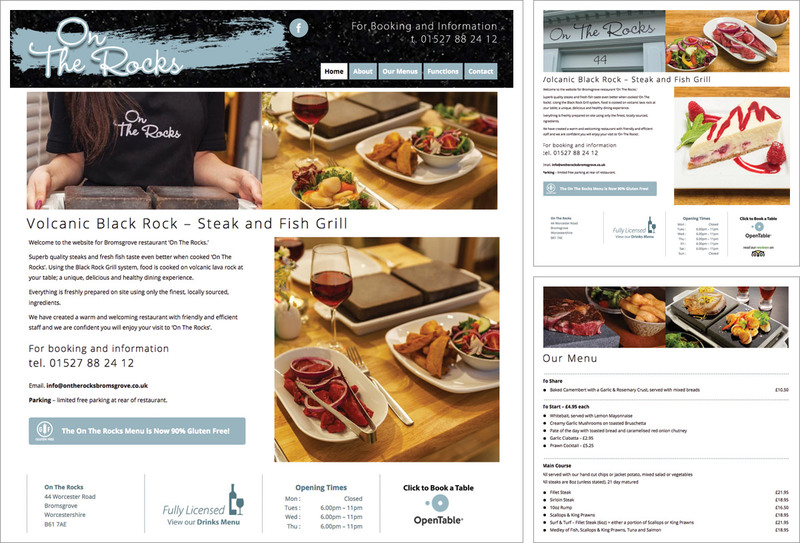 On The Rocks is a Bromsgrove Volcanic Black Rock Steak and fish Grill Restaurant. We converted their existing static HTML coded website to a responsive / mobile friendly design, developed in WordPress. Elements of the old site were retained, for example the branding and colour scheme and some of the content but improvements were made to the layout to make it more flexible for the addition of special menus. New images to reflect the current menu and restaurant decor have been added. We think it looks good enough to eat! Click HERE for more about why we feel ‘On The Rocks’ rocks! “From the very beginning, Brian could not have been more helpful. I had a good idea what I wanted in terms of content and colour etc but I needed someone who could translate those ideas into a web design. Brian took on-board everything we wanted but then took it all to another level! The end result is a very sophisticated looking but easy to use website. The majority of customers and/or service providers have all commented on how fantastic the website is and it has definitely has a very positive effect on driving customers into our Restaurant.